So my friend [ɦɑnɑ] has been playing Jeremina Paxmina for the University of York University Challenge team for the last few months, and while their fate in the tournament is a mystery until July, Hannah’s involvement in British quizzing got me to look into the serious fare offered in the UK. Here’s what I found: Serious British quiz shows are MEAN. They are unforgiving, humorless, exacting, and demanding of minutiae in zero seconds. I checked out University Challenge episodes on Youtube, as well as Only Connect, a Question of Genius, Countdown, Eggheads, and Mastermind. 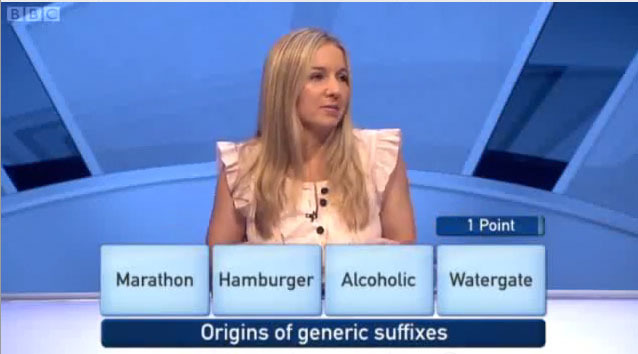 My favorite of the bunch is Only Connect, which ruthlessly demands teams to find the connection between words with the fewest clues possible. (I made my own Only Connect Wall but I wasn’t able to upload it onto the site.) On the Champions of Champions episode last August, one question revealed the word Marathon, followed by Hamburger, Alcoholic, and finally Watergate. Having recently written about this, I knew the connection when I saw Hamburger. In this jumble of words in my head I also realized that -nik, though less productive, has also jumped languages and meaning from its original context. Sputnik was an awesome satellite that the Soviets launched as a test, and they didn’t think it was a big deal until a day later when the rest of the world started freaking out about it and they started posturing like they meant it as a looming satellite of doom. In Sputnik, -nik means ‘er’ or ‘ator’ as in someone who does something. Interestingly the breakdown of sputnik is s-put-nik, the prefix ‘s-‘ means ‘with’, while ‘put’ is related to feet and travel. A good translation of sputnik is: fellow traveller. I learned this in an excellent breakdown of the etymology of sputnik which I found HERE. When English adds -nik to words, it carries connotations of suspicious activity, Cold War rivalries, and communist sympathies. Besides soviet stereotyping, -nik words have come into English through Yiddish channels. Sputnik-inspired words include: muttnik (poor Laika), beatnik, peacenik, nudnik, neatnik, no-goodnik, Wordnik, and Dr. Robotnik (from Sonic). As a final note, there’s nothing inherently wrong about misappropriating the endings of specific words to become suffixes available to the general lexicon. It’s just interesting to me from the perspective of the kind of words which have inspired suffix theft. In some way, Alcoholic, Watergate, Hamburger, Sputnik, and Marathon all captured a sense of meaning which had previously eluded speakers. By annexing a recognizable segment of those famous words, speakers could latch onto the feeling of these words in new situations which somehow resembled the original. Using part of the word is a bit like what Kevin Pollak feels about doing an impression of someone famous: You don’t have to work as hard to be charismatic or funny, because your audience is already fond of and familiar with the character. If you’d like a slightly more professional article about mutant words, check out the 2007 OUP blog post by Ben Zimmer about the popularity of the ‘Frankenword’ pattern. AHHHH THIS POST IS THE BEST. By which I mean, ‘congratulations on a well-executed and fascinating blog on why words remain the best thing ever’. i intend to do linguistics at university and the thought that the course will be filled with people who take pleasure in things like this has cheered an otherwise depressing day.